This week, as the public was digesting news of the imminent closure of Bank of India in Uganda, property mogul Sudhir Ruparelia’s Meera Investments dragged Dfcu Bank to the Land Division of the High Court, seeking to reclaim its 46 branches, which it says were acquired illegally following the dissolution of his Crane Bank. The closure of Crane Bank saw Dfcu bank become the third biggest bank after acquiring 46 branches from the then fastest growing financial institution in the country. Should court agree with the arguments of Meera Investments, all the 46 buildings occupied presently by Dfcu countrywide will be closed and reverted to them as they have asked court. As if that was not bad enough, Dr Ruparelia also filed for rent arrears from the bank currently occupying his buildings. In exercise of its powers, Bank of Uganda in January transferred the liabilities of Crane Bank to DFCU Bank. Prof Emmanuel Mutebile the Bank of Uganda Governor said in a statement that the central bank also conveyed Crane Bank’s assets to DFCU bank. 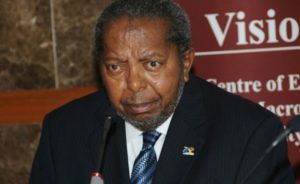 Prof Mutebile later in the week issued a statement on Bank of Uganda’s official page distancing the central bank from the imminent takeover of Bank of India in Uganda. The governor reiterated what PML Daily’s source at BoI in Uganda had stated that the bank is financially stable. However, our source confirmed to us after the statement was issued that indeed there was a meeting between BoI officials and officials from the central bank led by deputy governor Louis Kasekende. PML Daily has since learnt that the request for BoI asking that central bank takes over the bank are not related to financial instability of the bank in Uganda but a request from the mother bank in India which has also closed branches in New Zealand and Botswana. 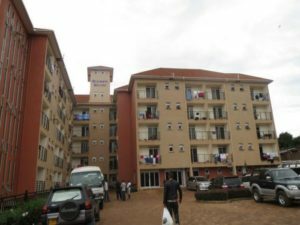 At police headquarters in Naguru, Kampala police spokesperson Emilian Kayima on Monday came out to explain a toxicology report which showed that two foreigners who died in two Kampala hotels were killed after foreign chemicals were found in their bodies, police have said. His boss the inspector General of Police, Gen Kale Kayihura followed this announcement with an impromptu press briefing the next day also stating that police are now treating the death of Tersvouri Toomajuha Petteri, a Finland national, at Pearl of Africa Hotel on February 8, and Alex Sebastian, at Sheraton Hotel on February 6 as murder. 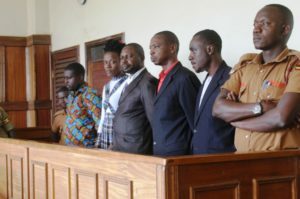 Mr Kayima said police have asked the Internal Security Organisation (ISO) to hand over five suspects arrested in connection with the death of the two foreigners in two Kampala hotels. 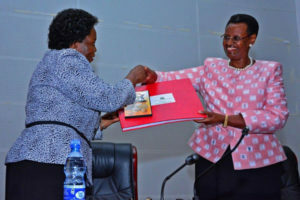 At East Africa’s oldest university, Makerere University administration, in a circular suspended 17 students from the College of Education and External Studies for examination malpractice and forging examination certificates. The university bursar also promised to pay government sponspored students their long awaited Living Out Allowances after announcing that they had sorted out the glitch that was holding the payment. Earlier reports indicated that the same monies had been used to pay off lecturers’ stipends. The lecturers had threatened a number of actions should their pay not come through as the semester opened. Drama broke out late in the week as students raided a lecturer’s office, forcing him to lock himself inside for fear of being lynched. Dr Anthony Juma Okuku cancelled results of more than 400 Urban and Rural Development students at the School of Social Sciences, claimning that the students had cheated. Armed with sticks and stones, a group of students stormed Okuku’s office claiming in the past Okuku has not been marking their scripts but issued marks. It took the intervention of the school dean, Dr Andrew Erias State to calm the students down. Self-proclaimed Ankole king Umar Asiimwe(2ndR) and co-accused appear in court on Tuesday. The 2017 Uganda Advanced Certificate of Education (UACE) exams released on Wednesday indicates that Wakiso and Kampala districts were the top performing districts while Nakapiripirit, Napak, Kotido, Buvuma and Dokolo came last. Female students outperformed their male counterparts with the examination body registering a tremendous drop in exam malpractice, but also a drop in performance overall. In 2017, 101,269 candidates registered for the exams, and only 34,819 students obtained at least three principal passes in the subjects they offered, with 1,141 students failing to attain any principal pass which is the least requirement for one to join university. At Kyangawali refugee camp in Hoima District, the number of cases of refugees who have succumbed to cholera is still on the rise. By Thursday, 26 people had been confirmed dead. Earlier this month, hundreds of refugees came across Lake Albert, escaping insurgency in neighbouring DR Congo. Embattled former Buyende District police Commander Mohammad Kirumira finally got to join his family in welcoming his new-born daughter after the police court in Naguru granted him bail. Kirumira is facing charges related to indiscipline in the Force and has been under detention at the dreaded Nalufenya detention centre in Jinja. He was granted bail after the maverick Afande Sam Omala stood surety for him. During the hearing in which Kirumira was granted bail, journalists and family members were denied entry. Police officers at Naguru were seen in a cat and mouse chase with journalists who tried to take pictures outside the police court. Police later came out to deny harassing any person. As infighting continues to rave away at the Health ministry, lately pitching the permanent secretary Dr Diana Atwine against Uganda Cancer Institute boss Dr Orem, celebrated radio presenter Alex Ndawula announced his return to radio late this week. The veteran disk jockey will grace the airwaves of Ntinda-based Jazz FM alongside fellow icon Christine Mawadri. Meanwhile the ruling NRM party in a surprise move fired its 200 staff members, claiming the party was financially constrained and therefore forced to restrucutre. 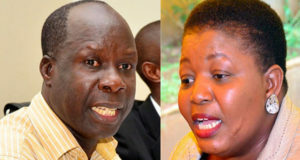 The annoumcement sparked off a war of words between party secretary general Justine Kasule Lumumba and the party electoral commission boss Tanga Odoi. Mr Odoi accused Ms Lumumba of poor administration and swindling party funds, which forced the party chairman, President Yoweri Museveni to call for the layoffs.